When a current passes between two electrodes — one thinner than the other — it creates a wind in the air between. If enough voltage is applied, the resulting wind can produce a thrust without the help of motors or fuel. This phenomenon, called electrohydrodynamic thrust (or, more colloquially, “ionic wind”) was first identified in the 1960s. Since then, ionic wind has largely been limited to science-fair projects and basement experiments; hobbyists have posted hundreds of how-to videos on building “ionocrafts” (lightweight vehicles made of balsa wood, aluminum foil and wire) that lift off and hover with increased voltage. Despite this wealth of hobbyist information, there have been few rigorous studies of ionic wind as a viable propulsion system. 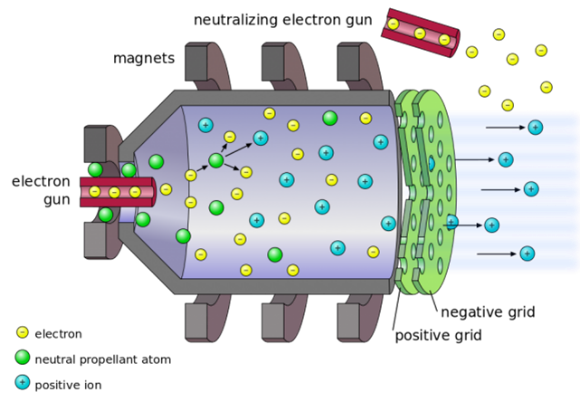 Some researchers have theorized that ionic thrusters, if used as jet propulsion, would be extremely inefficient, requiring massive amounts of electricity to produce enough thrust to propel a vehicle. Now researchers at MIT have run their own experiments and found that ionic thrusters may be a far more efficient source of propulsion than conventional jet engines. In their experiments, they found that ionic wind can produce as high as 100 newtons of thrust per kilowatt (100 N/kW), compared with a jet engine’s 2 newtons per kilowatt (2 N/kW). That as you understand is a massive improvement in efficiency and performance, well as to power capacity and availability, opening new horizons for applications that may as well exceed those of airplane propulsion.The team has published its results in the Proceedings of the Royal Society. Read the abstract here. A basic ionic thruster consists of three parts: a very thin copper electrode, called an emitter; a thicker tube of aluminum, known as a collector; and the air gap in between. A lightweight frame typically supports the wires, which connect to an electrical power source. As voltage is applied, the field gradient strips away electrons from nearby air molecules. These newly ionized molecules are strongly repelled by the corona wire, and strongly attracted to the collector. As this cloud of ions moves toward the collector, it collides with surrounding neutral air molecules, pushing them along and creating a wind, or thrust. There is one big obstacle to ionic wind propulsion : thrust density, or the amount of thrust produced per given area. Ionic thrusters depend on the wind produced between electrodes; the larger the space between electrodes, the stronger the thrust produced. That means lifting a small aircraft and its electrical power supply would require a very large air gap. Another drawback is the voltage needed to get a vehicle off the ground. Small, lightweight balsa models require several kilovolts. Hence a small craft, with onboard instrumentation and a power supply, is estimated that it would require hundreds or thousands of kilovolts. On the other hand, the propulsion of choice for science fiction writers has become the propulsion of choice for scientists and engineers at NASA. The NASA Glenn Research Center has been the lead for electric propulsion since work on ion propulsion began there in the 1950s. The ion propulsion system's efficient use of fuel and electrical power enable modern spacecraft to travel farther, faster, and cheaper than any other propulsion technology currently available. 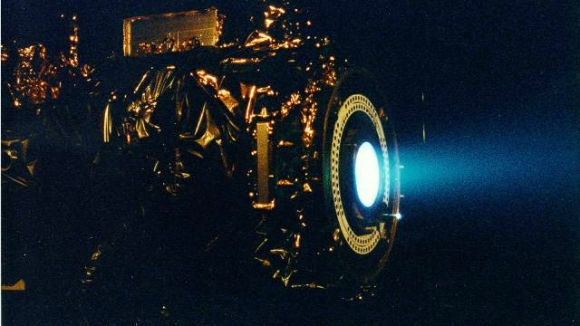 Ion thrusters are currently used for stationkeeping on communication satellites and for main propulsion on deep space probes. 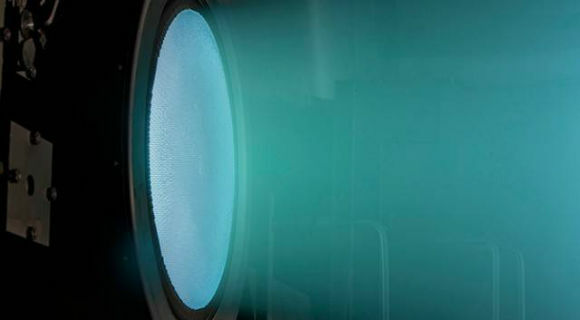 Ion thrusters, are somewhat different to Ionic Wind Thrusters, although they too expel ions to create thrust and can provide higher spacecraft top speeds than any other rocket currently available. The Dawn Mission is one of those examples. 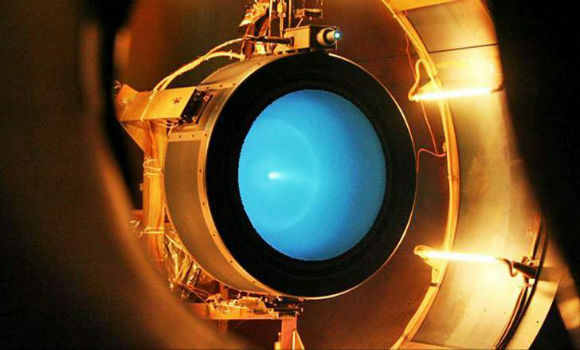 The downside of ion thrusters, though, is that the amount of thrust produced is minuscule: State-of-the-art ion thrusters can deliver a grand total of 0.5 newtons of thrust (equivalent to the force of a few coins pushing down on your hand), while chemical thrusters (which power just about every spacecraft ever launched) on a satellite or probe deliver hundreds or thousands of newtons. The flip side of this, though (and the reason ion thrusters are so interesting) is that they have a fuel efficiency that’s 10 to 12 times greater than chemical thrusters. Obviously, for long trips through space, fuel efficiency is very important.